Personal income tax is a direct tax on the income from all sources of an individual adult, communities and families, and on executors and trustees. Personal income tax is calculated after some reliefs have been given and or certain expenses exempted according to a graduated rate specifies by PIT. The self-employed like sole proprietors, traders etc. The employees pay their income taxes under Pay As You Earn (PAYE) i.e their income taxes are deducted at source. The employer is the one responsible for deduction of the personal income tax and subsequent remittance to the tax authorities. The self-employed are assessed to personal income tax and pay under the direct and self-assessment. They file for their income tax return on annual basis together with their self-assessment and pay. State Internal Revenue Service administers and collect personal income taxes on all individual adult, communities and families, executors and trustee’s resident in a state under its jurisdiction for example Lagos State Internal Revenue Service administers and collect personal income tax. a.) Persons employed in the Nigerian Armed Forces and Police other than in a civilian capacity. in a civilian capacity. b.) Employees in the Nigerian Foreign Service. d.) Nigerians residing outside Nigeria but deriving income or profit from Nigeria. Before the amendment to the Personal Income Tax Act in 2011, there were relief in form of personal, children, dependant relative; and allowances in form of leave allowances but with the amendment these relief allowances in form of Housing, Transport, Meal, Entertainment, Utility and Leave. All these are replaced with Consolidated Relief Allowance of the higher N200,000 plus 20% gross income and 1% of gross income. a) Contributory Pension Scheme: Every employee in public sector and private organizations with 15 or more employees are to participate in this scheme. Private organizations with less than 3 employees are expected to participate in the scheme as laid down in the guideline to be issues by National Pension commission (PenCom). An employee is expected to contribute 8% of his or her emolument on monthly basis. It is not out of bound for the employer to take full responsibility for the contribution of the employee. In that case the contribution must not be less than 20% of the employee emolument. This contribution by an employee is a deduction and tax exempt. b) National Health Insurance Scheme: Employees are to contribute 5% of the basic salary on monthly basis. This is expected of all organizations in public and private sectors. It is not out of place for employer to take full responsibility for the contribution of employees. The contribution by employee is a deduction and tax exempt. c) National Housing Fund Scheme: Employees are also to contribute 2.5% of their monthly salary towards National Housing Scheme. All organizations in public and private sectors. The objective is to make affordable housing available to low and medium income earners. The contribution by employee is a deduction and tax exempt. d) Life Assurance Premium: Any employee who has a life assurance policy will have the premiums paid for the life assurance policy deducted and tax exempted. Under the Pension Act, the employer is mandated to take group life assurance cover for the employees. The insured sum for this is minimum of three times the annual total emolument of the employee. This is also a tax exempt for the employer. e) Gratuities: Are payment made to a certain category of employee either as a lump sum or severance package on retirement or resignation from employment based on agreement between the employee and employer. Gratuity is exempted from tax. These rates are applicable to personal income tax generally whether it is employees or self-employed (under the direct and self-assessment). – Above N3, 200,000 of income @ 24%. This is when the taxable income of an individual or person is nil or lower after the deduction of Consolidated Relief allowances and other tax exempt. In other words, the personal income tax of such person will be zero or negative. If this situation occurs, then the person will pay 1% of annual gross income. 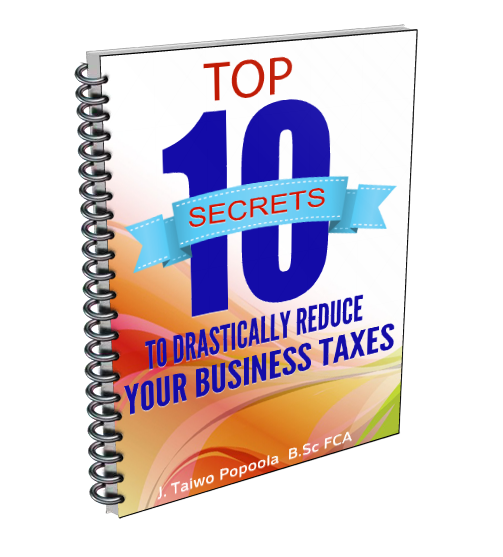 This is applicable if the taxable income is below N300,000. The law anticipated that it is possible to use this to evade tax, that is why minimum tax was inserted in the law. In the case of employees, the personal income tax so deducted from the salaries and wages on a monthly basis, must be remitted (paid) to the respective State Internal Revenue Service or Federal Inland Revenue Service (as stated earlier) before the tenth day of the following month. For example, personal income tax deducted from the employees’ salaries and wages for the month of April must be remitted before the !0th of May. Self-employed are to self-assessed themselves and paid the amount to the relevant tax authorities. Employers are to submit comprehensive list of their employees together with PAYE deductions every month as the PAYE tax is being remitted. This must be filed with the relevant tax authorities. Employers are also to file annual return of Employment Income and Tax remitted in respect of their employees in the previous year through form H1on or before 31st of January of every year. The objective of this is to enable the tax authorities to check the correctness of the remittances made in respect of the previous year. The self-employed person is to file a return of income earned in the preceding year through Tax Form A without notice or demand. Failure on the part of employer to deduct or remit PAYE tax is an offence under the relevant section of Personal Income Tax Act Amended 2011, attracts penalty of 10% of the amount of tax not deducted and or not paid or remitted with interest at commercial rate, in addition to the payment of the unpaid/unremitted tax. Not payment/remitting taxes is an offence under the relevant Personal Income Tax Laws, and failure to pay tax can result in an imposition of an additional 10% of the amount of tax not paid/remitted, in addition to the amount of tax due, and any costs incurred in the recovery of the sums due.